Zero feet to Lake Michigan. Make sure you don’t fall in. We’re located in Milwaukee’s Harbor District right on the water. That’s part of what makes our School unique. The School of Freshwater Sciences offers the ideal location and resources to study water in all its complexities. Our faculty and students not only have direct access to the water but also to one of the best water-focused research facilities in the world. 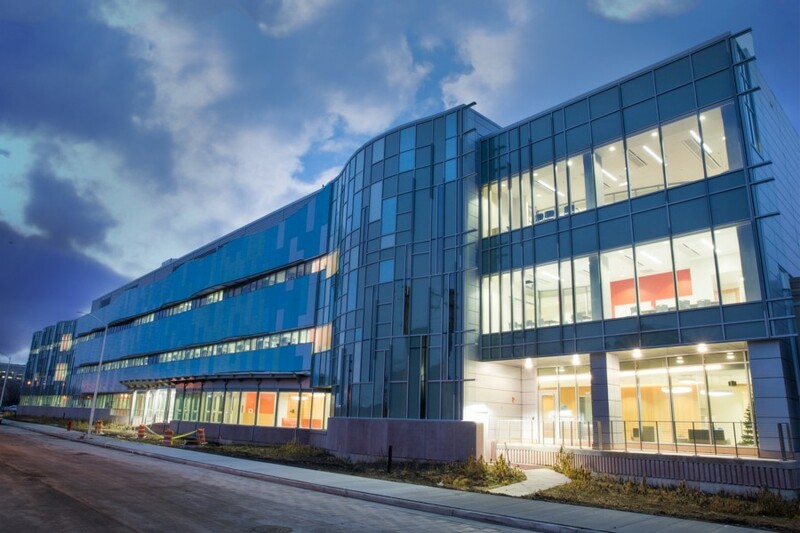 The $53 million, 92,000 square foot research building opened in 2014 and features biosecure and quarantine labs for studying aquatic species; flexible learning commons where students can study or where the School can host external groups ; a pathogen testing facility; the scenic Harborview Conference Room; and the Great Lakes Genomics Center—the first DNA sequencing lab in the United States dedicated to water and environmental issues. We moved into this converted ceramic tile factory back in 1973 and have been conducting freshwater research here ever since. Many of our research groups and on-site collaborators maintain offices here, including the Great Lakes Aquaculture Center, which occupies several large labs and a wet bay for Great Lakes and field research. The $53 million addition to the School of Freshwater Sciences gives a sleek façade to the School’s original building on Milwaukee’s Inner Harbor. 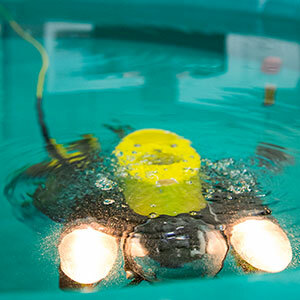 Remotely operated submersibles. Drones and hexicoptors. The Lake Michigan Autonomous Robot (LMAR). These are a few of the robots employed by the School of Freshwater Sciences to study the Great Lakes and other freshwater systems. In the Aquatic Robotics Lab engineering and freshwater sciences students collaborate with faculty to design, build, and operate robots capable of performing essential research tasks, from collecting live organisms from the bottom of Lake Michigan to tracking lake sturgeon in the Winnebago system. Modeling lake dynamics and how contaminants move through the system. Predicting rainfall down to the square kilometer or the next 100 year storm. Interpreting the vast quantities of data that come from DNA sequencing. Freshwater research often requires the creation of complex models or the use of large data sets to understand intricate interactions of numerous actors. That is why the new addition to the School of Freshwater Sciences research building is equipped with several data visualization laboratories that allow these models to be visually displayed and interacted with in real time. Our faculty and senior scientists maintain their own research labs, each with a dedicated team of students, technicians and research assistants. Labs are divided into ecosystem dynamics, water technology, and human and ecosystem health, which have been designated as the Kikkoman Healthy Water Labs in recognition of the company’s generous support of the School and dedication to clean water for all. The Center for Water Policy maintains a group of offices embedded among the science labs in order to facilitate collaboration. We maintain a full-service electronics, fabrication, and machine shop where parts and full assemblies are custom made. The shop’s skilled staff of machinists, instrument makers, and electronic technicians take ideas and turn them into reality on a daily basis, building equipment used in research throughout the Great Lakes and around the world. A major draw for prospective faculty members and students, researchers can take advantage of the shop’s resources to keep experiment costs down and reduce the time it typically takes to get equipment on order. This collection of five labs and support facilities houses state-of-the-art equipment resources for our students and faculty. Each lab has a specialization and unique purpose—Organics, Inorganics, Nutrients, Radiology, and Microbiology—useful in uncovering a wide variety of water issues. Key equipment such as an Inductively Coupled Plasma Mass Spectrometer (ICPMS) allow for the detection of contaminants, determining the age of water in a system, or tracking the movements of nutrients through the ecosystem. The only lab in the world solely dedicated to environmental issues and ecosystem health. Established with over $2 million in private support, the lab maintained by the Great Lakes Genomics Center houses four powerful DNA sequencers capable of uncovering pathogens in urban infrastructure or determining impacts of pharmaceutical contaminants in the world’s surface waters. Unique labs that facilitate the development of new aquaculture technologies. From spawning fry to testing recirculating aquaculture systems for the grow out of North American Yellow Perch, the Great Lakes Aquaculture Center maintains large labs in our Port Building that are a major focal point of our water technology research. 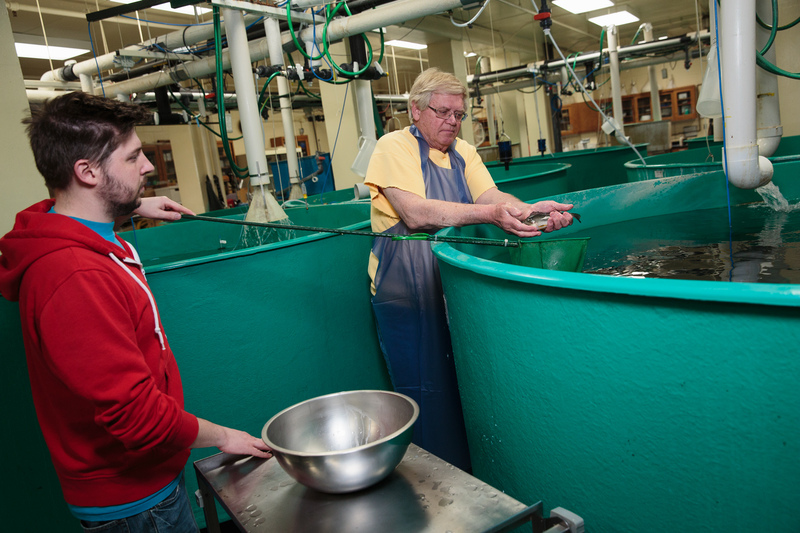 These labs are involved in long-term management and conservation of non-aquaculture fish, and are one of the few locations in Wisconsin permitted to spawn and raise Lake Sturgeon. These specialized facilities allow research of diseases in fish populations with impact on fisheries and tourism. Quarantine facilities allow researchers to bring aquatic organisms back to our labs from the wild without risking the health of other research animals in the building. Our unique Aquatic Biosecure facilities allow us to research the effects of diseases and parasites on fish while looking for solutions that can help managers maintain healthy populations for fisheries and tourism. The combination of these facilities is almost unheard of in the academic research community, allowing Freshwater Sciences students and faculty the unique opportunity to conduct research of vital importance to the long-term health of our water resources.